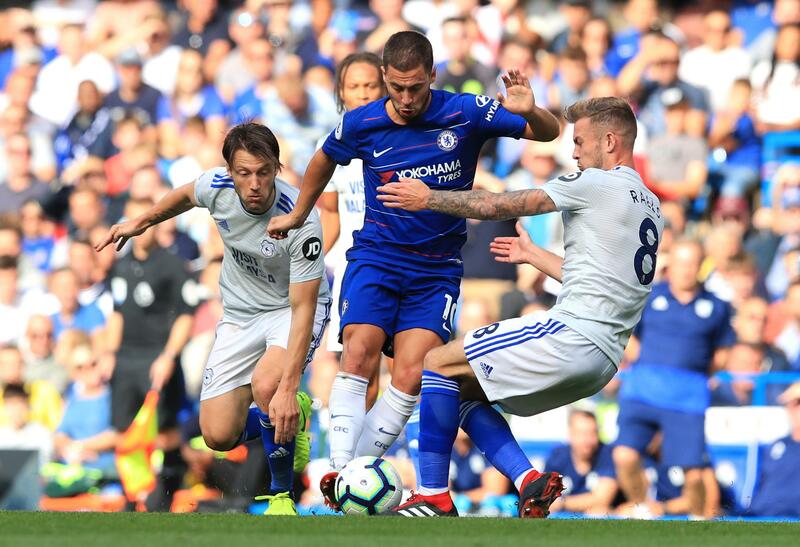 Chelsea travel to Wales looking to get back on the right track, after their disappointing 2-0 loss to Everton before the International break, which has dented their chances of finishing in the top 4 at the end of the season. The Blues haven’t won in two Premier League games, with them drawing against Wolves and losing to Everton. Although they have been on a poor run of form, Chelsea only remain three points outside the top 4. So a win on Sunday will put Chelsea back in real contention of finishing in a UCL place. Their opponents Cardiff are in a relegation battle, so they will need the three points as much as the West Londoners. Before the International break, Cardiff picked up an impressive 2-0 home win over West Ham, to boost their hopes of survival from the Premier League this season. Can the Bluebirds use their home advantage to gain a vital three points, which would be a huge statement for Neil Warnock’s men? Cardiff have suffered a major injury blow in the lead-up to this match, meanwhile, as joint-leading goalscorer Callum Paterson rolled his ankle on international duty with Scotland and, like Sol Bamba, will play no further part this season. Warnock also hit out at Iceland for their management of Aron Gunnarsson’s playing time, with the midfielder – due to depart City in the summer – expected to sit this one out. Harry Arter and Joe Bennett have been carrying knocks, but Cardiff will otherwise be well rested, more than three weeks on from their most recent outing. Sarri will be pleased that, despite a number of his players being sent off on international duty, none of them has returned with any injuries. Ethan Ampadu and Marco van Ginkel are Chelsea’s only confirmed absentees, and would not have featured even if they had been fit, while fringe players Davide Zappacosta and Ruben Loftus-Cheek will require late fitness tests. The likes of Cesar Azpilicueta, David Luiz, Pedro, Willian, Gonzalo Higuain and Marcos Alonso have spent the last two weeks at Cobham, meaning that they are all in strong contention to start here – bad news for Hudson-Odoi, who impressed on his first two appearances for England. Cardiff’s predicted starting eleven- Etheridge; Peltier, Manga, Morrison, Bennett; Murphy, Ralls, Arter, Hoilett; Camarasa; Niasse. Warnock on the game at the weekend: It’s difficult, we know the situation. We watched the Everton game which they lost 2-0 and how they weren’t 4-0 up at half time, I don’t know. These two sides have met 44 times in all competitions over the years, with Chelsea edging the head to head record against the Bluebirds. The Blues have beaten the side from Wales on 19 occasions. There have been 10 draws between these two side over the years. And Cardiff have beaten the West-Londoners 15 times in all competitions. In terms of league head to head record, these sides have met 37 times. Chelsea have beaten Cardiff on 18 occasions in league competitions, including their last trip to South Wales in the 2013/14 season, when Torres and Schurrle goals helped Chelsea to a 2-1 win at the end of that season. There have been eight draws between these two sides in league competitions. And the Bluebirds have beaten Chelsea on 11 occasions in league competitions. The last meeting between these two sides came earlier this season at Stamford Bridge, when a Eden Hazard hatrick helped Chelsea thrash Cardiff 4-1 in September. Sky Bet have made Chelsea favourites to take three points from this encounter at the Cardiff City Stadium on Sunday, with a win for Chelsea being priced at 4/9. A draw between these two sides is being priced at 10/3. And a surprise Cardiff win is being priced at 13/2. My realistic prediction as a journalist for this game is a tight 0-1 win to Chelsea. My optimistic prediction as a Chelsea fan for this game is a 1-3 Chelsea away win. I think the players will bounce back after their shambolic performance before the International break against Everton. I think Higuain will score 2 goals, and Jorginho will also bag a goal here, with Niasse scoring the only goal for Cardiff. Previous postSarri’s conference ahead of Cardiff- The Transcript.